Home Applications iPhone App Helps Women Evaluate Their Boyfriends and have a great fun! iPhone App Helps Women Evaluate Their Boyfriends and have a great fun! 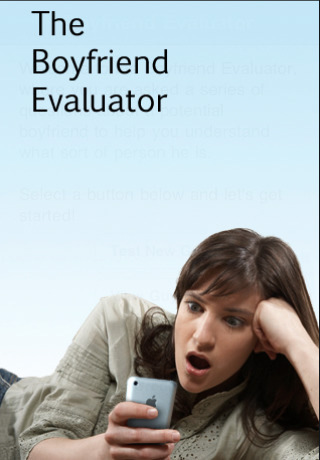 Today Cogitoad is introducing their new product-app for iPhone iPod and iPad touch called Boyfriend Evaluator 1.0. The app offers new service that will make all the girls addicted to their iPhones as the matter goes to boys! Now the girls will be able to predict whether the person they choose will be the man of their lives. The Boyfriend Evaluator contains 50 questions. After answering the questions app analyzes the data and you’ll receive numerical score and information including detailed description of your partners displayed negative traits and general compatibility with your boyfriend. The results will help the woman evaluate objectively how compatible a boyfriend is for more serious relationship and at the same time have a great fun. Pricing and Availability:Boyfriend Evaluator 1.0 is only $2.99 USD and available worldwide exclusively through the App Store in the Social Networking category.